Managing colostrum is critical to calfhood health. With proper colostrum feeding you can improve not only the calf morbidity and mortality rates, but also increase milk production. Colostrum feeding should be done within 30 min of birth with at least four quarts of colostrum containing a total of 200IgGs, minimal bacterial count and be at 105F. Getting all that done can be tricky, especially with multiple people responsible for the calving area. That’s why we bring you the best colostrum management systems in the industry.Download the Calf Hero Colostrum Management brochure. 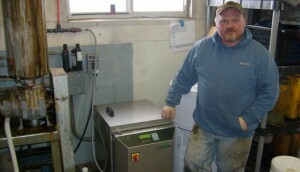 The newest line of colostrum pasteurizers. With built-in smart technology, this pasteurizer will text its users to announce that a cycle is complete ensuring that the next steps of feeding or storing colostrum are taken immediately. Its large capacity of 6 and 12 meals, is coupled with precise temperature sensors and Internet connectivity to satisfy demands of the largest of dairies. For everyday users, this pasteurizer offers a large, easy to use touch screen with the ability to easily switch between English, Spanish, and French. For managers, it carries a peace of mind with its SmartErrors handling system, ability to view and download log history and improved efficiency of both water and energy consumption. Calves are the future of your dairy. Much like an architect, who must design a solid foundation in order to build a skyscraper, you are in charge of building a foundation for the future of your dairy herd. Research has proven that a calf, which has been fed colostrum properly, is less likely to get sick, more likely to have an increased daily gain, calf-in sooner and most importantly become a better milk producer. The first hour is the single most important hour of the calf’s life and one that will impact your herd two years from now, so wouldn’t you want to do it just right? The Calf Hero Colostrum Management System featuring the ColoQuick units has been implemented on dairies of all sizes with tremendous success. Our customers reap the benefits of simple and easy to follow protocols. The results are immediate from lowered pharmaceutical bills, improved passive transfer, increased average daily gain to more productive employees. We have helped dairies all across North America. Let us know what you’d like to improve and see if the colostrum management is a good fit. Dairies come in different shapes and sizes and no two are alike. We understand that and have designed our colostrum management system to be able to apply itself to your needs, but yet create consistency and easy to follow protocols. From a simple colostrum thaw unit to a high capacity colostrum pasteurizer, we offer a selection that is sure to fit your needs. Learn about our ColoQuick units here.